Everyone came out this week to bid our subway knitter a fond farewell and wish her all the best in her new city and her new subways. We'll miss you! 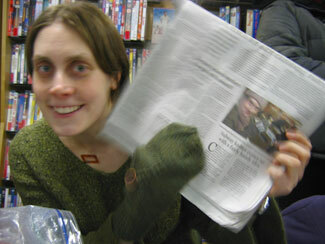 Colleen isn't just the subway knitter, she's a subway celebrity now! We're all so proud - it couldn't happen to a more deserving person and knitter! Colleen's working on more sockapaloooza socks! 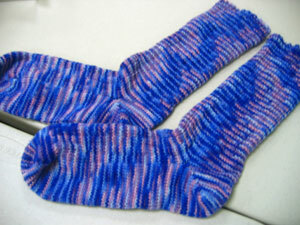 These are Pomatomus socks and she's made the pattern a lot easier by not twisting all the knit stitches. Clever, Colleen! Shhhh.... Colleen's keeping quiet on her blog so far, but this week at Knitsmiths, she finished her cozy scarf and her sockapaloooza socks! 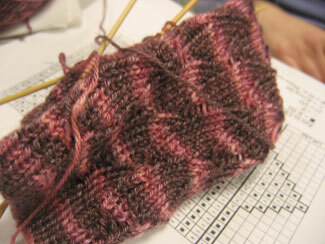 Colleen's is also working on her sockapaloooza socks. 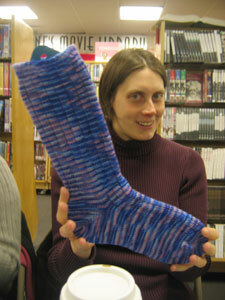 She's using Dani's handpainted sock yarn and the first one is all done! Playing with scale is fun. 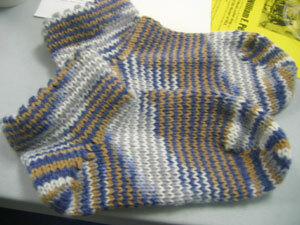 Colleen's just-finished short-row slippers. They're in an old acrylic yarn from her grandma (see her post here) and are soooo comfy looking. 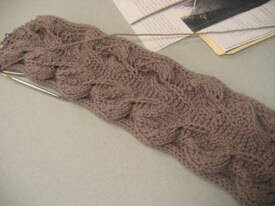 That pooling is wicked cool too! 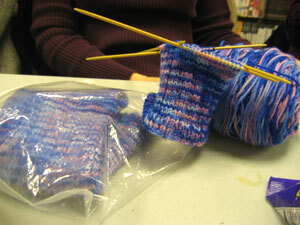 Colleen's making the coolest fingerless gloves with a great contrasting color on the fingertips. 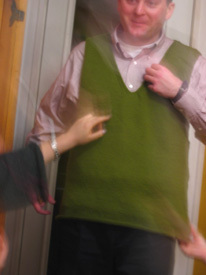 And speaking of fingers, look at how much everyone this week was admiring the beautiful vest that Colleen made for Matt! 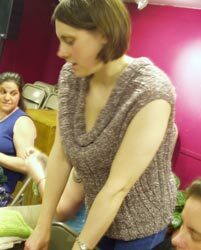 Colleen is making Annie Modesitt's Backyard Leaves scarf from Scarf Styles. A Knitsmiths' exclusive (at least for a few hours! 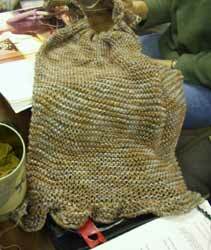 ): a peek at Colleen's just-finished version of the Baccarat tank. Isn't that neck gorgeous?! One thing I love about Knitsmiths is that we often get sneak peeks at things that some of the knitters haven't even posted on their blogs. Here's a little fabulous something something that Colleen just finished. Details to come on her blog someday. 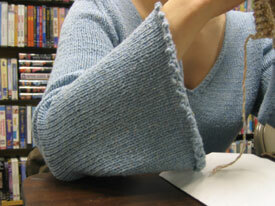 Colleen's beautiful belled sleeves on her Spring Breeze V-Neck Top (free pattern here). Colleen's almost all done with her incredible Madison coat. She's just got the pockets to finish. I bet we'll be seeing some finished pictures on her blog soon! 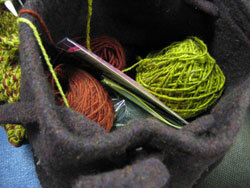 I missed Knitsmiths last week, but I still noticed that one of our best knitters has started a new blog. 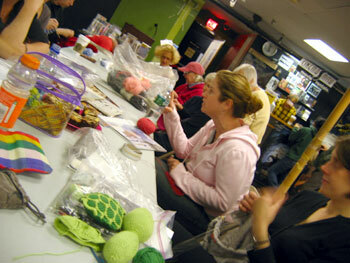 Check out Colleen's blog, Subway Knitter! 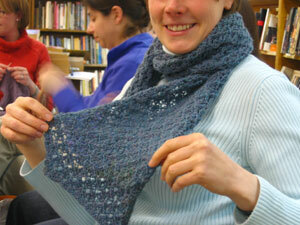 Colleen's working on the Madison Coat, a Circles knitalong project. 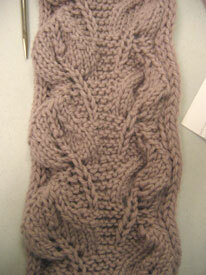 It's a large gauge, quick knit project knit with three yarns held together. My favorite is the green Tahki Soho yarn. Circles has amazing yarns! 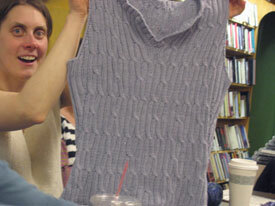 Colleen's making a shapely tank! Colleen's made another amazing tank. 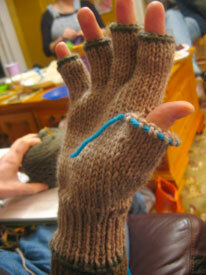 This one's in Silky Wool and has the sweetest little cables along all the edges and the sides. Another amazing top from Colleen. She looks like a model in this fabulous cowl neck tank! If I could whistle, I would. 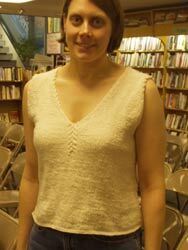 Colleen's finished Side to Side pullover from the Spring Interweave Knits. 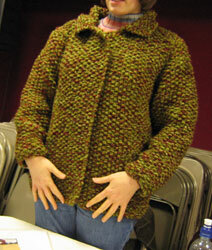 She used a fabulous ribbon yarn which gives the sweater a lot of drape. Really lovely, Colleen! 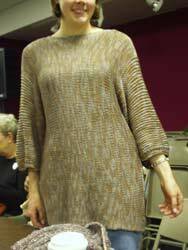 The side to side sweater from the latest Interweave Knits (Spring 2004). In the most amazingly soft Soy Silk yarn. Yes, people, it's made from soy! 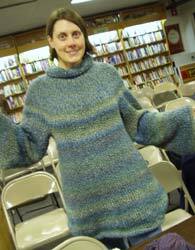 Check out Colleen's first sweater! 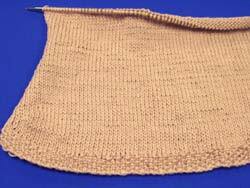 The pattern is Top Secret from Knitty and the yarn is Lion Brand Homespun. Awesome job, Colleen!